All hail Rex, now in his fourth generation and still a most-outrageous Subaru pocket rocket, blogs Dan Scanlan. 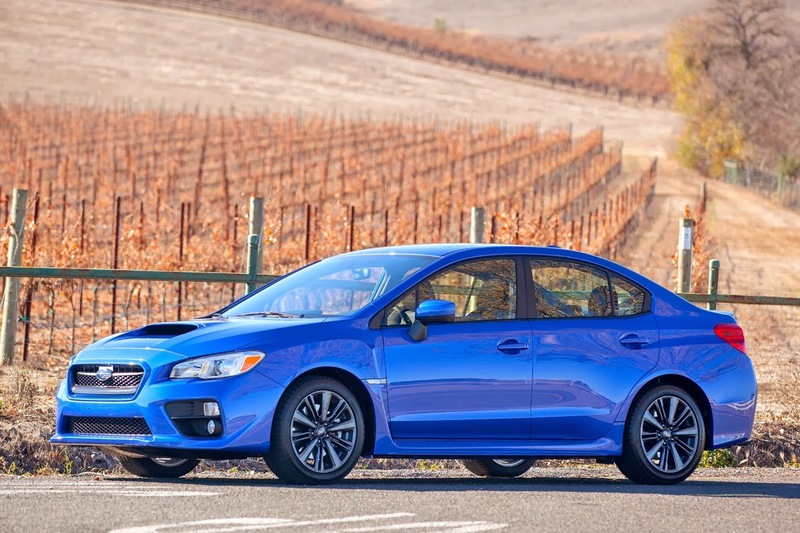 Rex is the 2015 WRX, which stands for World Rally Cross, as in the World Rally Championship. 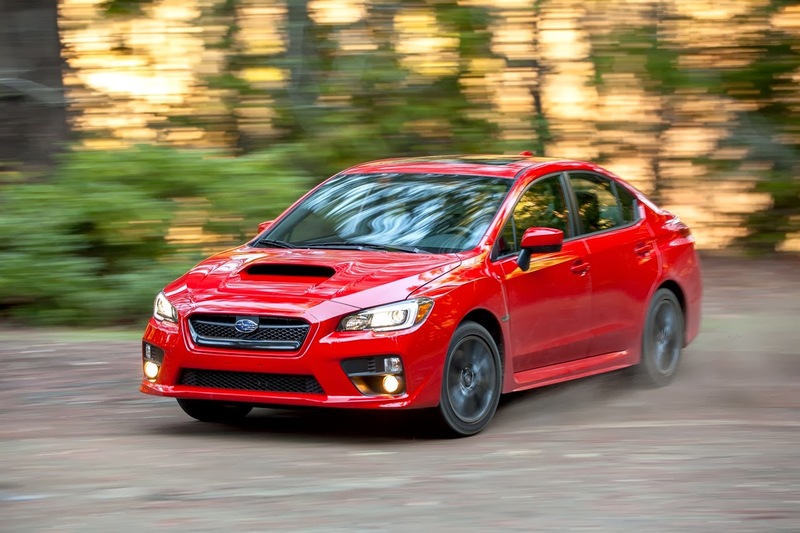 And the latest generation actually gets back more of the visual mojo that the WRX used to have, plus a stiffer chassis, a new turbocharged 2-Liter 268-horsepopwer direct-injection turbo BOXER engine … and a Lineartronic CVT. Yes, Rex gets a shifts-for-itself Continuously Variable Transmission with manual mode. 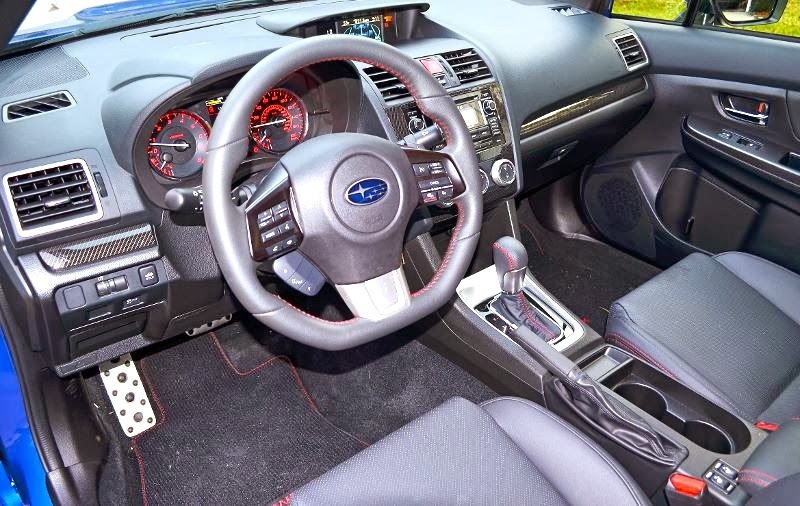 The WRX, like the Mitsubishi Lancer Evolution, have always been cars that follow the age-old formula – take a basic car and stuff it full of fun stuff. So let’s see if Subaru can teach Rex any new tricks. The first WRXs were for overseas consumption when Subaru introduced the performance model in 1992. Now comes the Gen IV WRX with a new wide-body sedan design sans hatchback. A bolder front design has deep lower air dam under a wider-mouth lower intake. Bigger side brake inlets host fog lights under running lights. Its more prominent “nose-cone” combines grille and bumper cap into one unit ahead of the aluminum hood, which gets a slimmer (functional) hood scoop. The slimmer headlights have a more sinister look and C-shaped LED running lights. 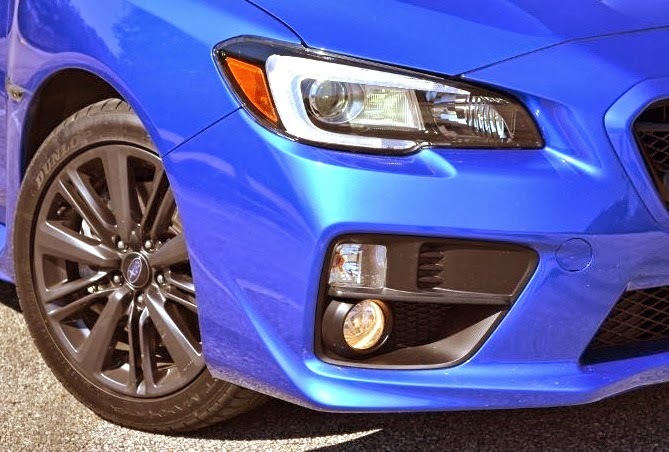 Headlights flow into the wide edgy flared front fenders with polished alloy WRX badge over the long vent, its lower edge flaring into a wide lower sill that visually lowers the car’s stance and flows into the rear fender. In back, big taillights frame a petite spoiler, while the finned aero under-bumper fascia’s quad tailpipes is a view many will see going past them. Our test sedan is Rally Blue riding on graphite gray 16-spoke alloy wheels fitted with very sticky P235/45 R17-inch Dunlop SP Sport Maxx RT rubber. It isn’t pretty – just really purposeful. 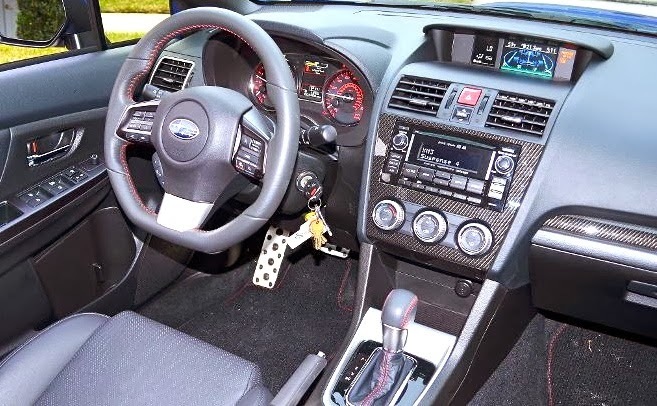 That steering wheel rim is fat and leather-clad with red stitching. Tucked in the left spokes are controls to punch up a digital speedometer and stopwatch under the instant mpg gauge and customize screen settings. Black plastic paddle shifters are behind the wheel. High center on the dash is that multi-function screen with AWD display, digital turbocharger boost/average mpg/acceleration percent and analog boost gauge with peak boost and acceleration percent. Dead center in the dash surrounded some pretty good fake carbon fiber trim is a 440-watt/9-speaker harman/kardon audio system with AM-FM-CD-XM content, a USB and MP3 audio input under the center armrest. A/C knobs are cheap feeling. What improves the overall feel are heavily bolstered form fitting and comfortable sport bucket seats up front. The driver gets eight-way power adjustments, and both get seat heaters. With an inch-longer wheelbase, the back seat has good head and legroom. Rear seat backs split and fold to access a usable 12 cubic-foot trunk, up .7 from the previous WRX sedan. Anyone buying a ticket to this ride wants a bit of the World Rally Championship. 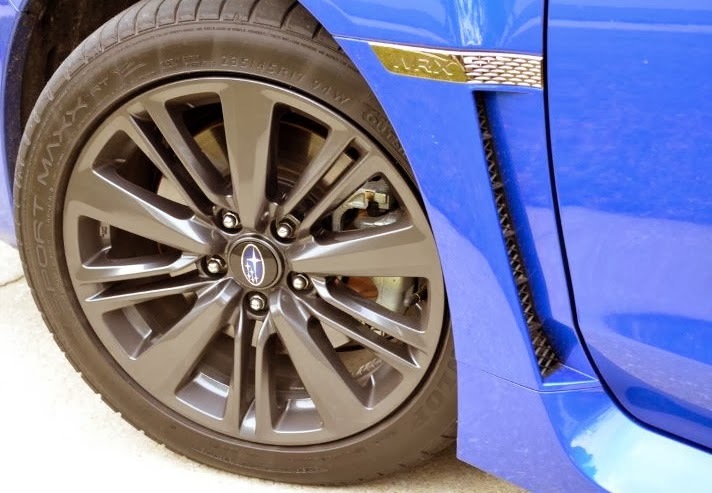 The 2015 WRX offers a nice taste of that via its turbocharged aluminum two-liter flat four engine. 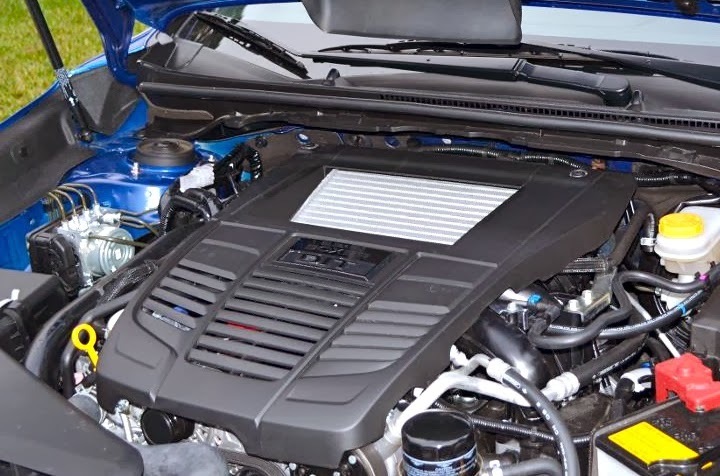 It has direct fuel injection, high compression (10.6-to-1) and a twin-scroll turbocharger with intercooler to produce 268 horsepower at 5,600 rpm, its torque curve peaking at 258 pound-feet over a very useable 2,000-5,200 rpm range. The CVT offered stepped “gear changes” instead of the usual method of pinning the engine at a high rev range and varying the belt and pulley ratios to accelerate. When we selected SI Intelligent, we got six well-spaced, fuel-efficient ratios and slightly more sedate launch and passing, allowing Rex to behave in traffic. If we wanted to hotfoot, Sport or Sport # got eight preset ratios that shift deeper in the torque with a very responsive gas pedal and quicker throttle response. That said, the CVT saps a bit of the immediacy previous WRXs, a bit less visceral. Maybe Subaru decided the audience has matured and so should the car. We averaged 22-mpg on premium, a tad better than the 2011 I tested. The quad exhaust lets rip a more sedate snarl when pushed, turbo whoosh and a bit of wastegate whistle still there. 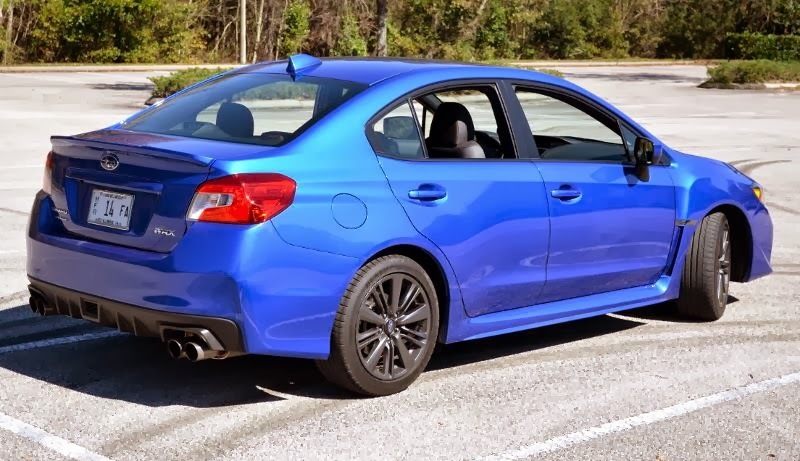 Under the chunky skin lies a new body structure with torsional rigidity increased 41 percent compared to the previous WRX. The result is a noticeably stiffer ride with very quick suspension movement on rougher roads, but no harsh impact at full rebound thanks to that stiffer platform. That kept the rubber on the road more often on bumpy curves, handling aided by a planetary gear-type center differential and electronically controlled hydraulic transfer clutch between the front and rear. In normal driving the torque split is 45 percent front/55 percent rear for some rear-wheel-drive agility. Push harder and it will shift torque to the wheel that needs it, although the center screen’s display never showed that. The Active Torque Vectoring also taps the front brakes in athletic turns to reduce understeer. The result was all-wheel-grip in turns and a near-neutral front wheel attitude when you’d push – it just cornered like it was on rails with minimal body roll. As we autocrossed it, the WRX just stayed neutral as it clawed, grabbed and went around corners. If we went in too hot there’d be a squeak of understeer before it grabbed and pulled out. It also felt and acted very sure-footed in rain. bit of brake fade after a few hard hits. 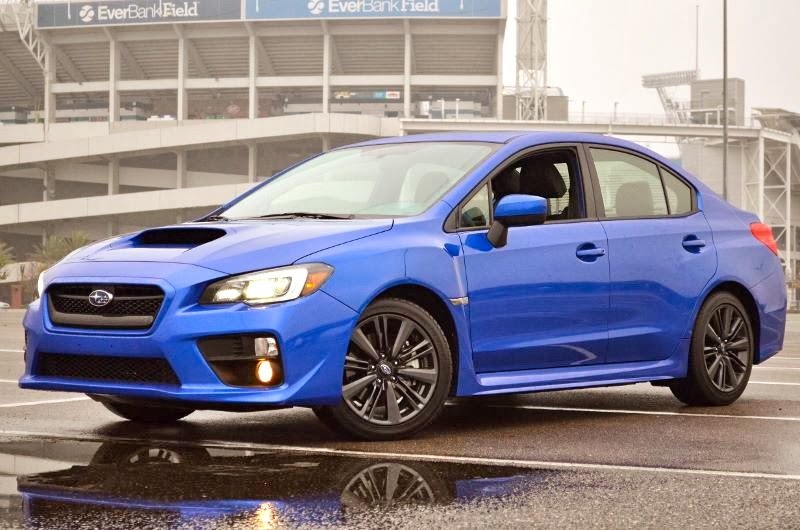 The 2015 WRX has a base price of $26,295, while a Limited starts at $29,995 and our CVT test car was $31,195 with standard heated front seats, power moonroof, fog lights, low-profile trunk spoiler, leather, eight-way power driver’s seat, the LED headlights accents, Sport Lineartronic transmission, 440-watt harman/kardon audio and keyless remote. I miss the smoother looking 5-door. But in terms of a car that I’d love to live with every day with power, handling finesse and endless grip for less than some bona-fide sports cars that easily match its ability, Rex is mighty fine in my book.